Hemel Hempstead Town are looking to make it four consecutive wins at the start of the 2015/16 National league South Campaign as they welcome Maidstone United to Vauxhall Road tonight. 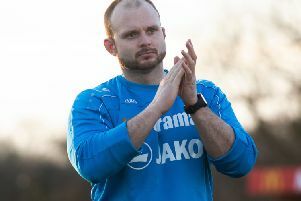 Hemel go into the game full of confidence, having beaten Weston-Super-Mare 4-2 on Saturday. That win came on the back of consecutive 1-0 victories over Dartford and Chelmsford. The Stones, meanwhile, were promoted to the National League South in the summer as Isthmian League Premier Division Champions. They started the season with a 2-0 away win at Sutton United, but have since lost back-to-back home games against Ebbsfleet United and Oxford City. Hemel go into the game as strong favourites, but will again need to dig deep as an extensive injury list continues to hamper the side’s preparations. Looking ahead to the game, Hemel manager Dean Brennan confirmed that it is still touch and go whether two of his squad will be ready to return to action: “Ed Oshodi hasn’t played much so he won’t come into the 16 tonight, but Dennis Oli and Mo Shariff will have fitness tests,” he said. “We are hoping that John Frendo and Ed Asafu-Adjaye will come back into the fold on Thursday so that will be a boost.